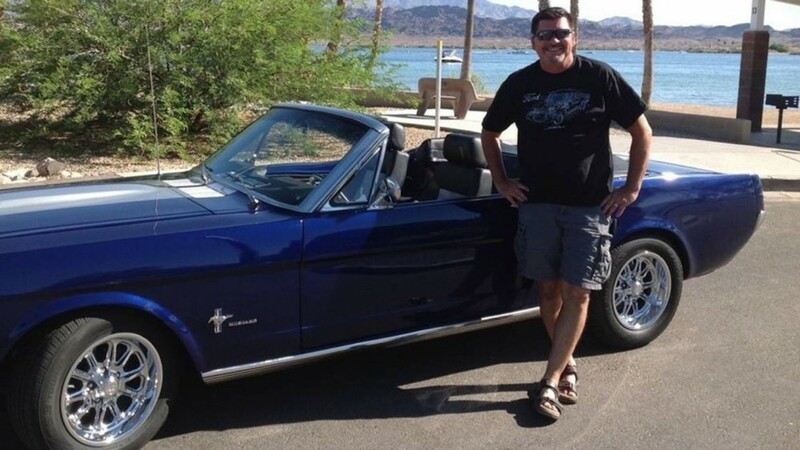 A Man Inadvertently Buys Back His Lost 1966 Ford Mustang. It was meant to be, according to Tab Lagow and his 1966 Ford Mustang convertible. It’s difficult to argue otherwise. While growing up in California, Lagow spent a majority of his time in auto body shops. He later turned his car knowledge into a side business by flipping Mustangs. One of those was a 1966 convertible that he purchased on Ebay for $1000. An older man bought it as a father-son project, as it arrived in pieces. Lagow didn’t think much about the car after that. Tab later remarried. His wife, Dana, owned an early 1964 and a half Mustang that he restored. It didn’t have AC, and as the couple drove in 110-degree heat in Lake Havasu, Arizona, they said that a convertible would be the one to buy. So Tab sold the 1964 1/2 and began looking for another project car about three years ago. He found a Red 1966 on Ebay that was located in Southern California. It had a clean body but no interior or top. A 5.0-liter engine was installed (but not hooked up) by the previous owner. He decided to buy it, as most of the car parts came in boxes. Lagow, now 58, was acting “like a kid at Christmas”. As he was searching, he pulled out a Ziploc bag that contained nuts and bolts and a note that read, “Bolts for driver’s door.” He laughed, saying it looked a lot like his handwriting, as he showed the piece of paper to Dana. Then he opened another baggie and saw another note. He realized “That IS my handwriting.” Lagow turned the paper over, and on the other side were the words, “Good morning, my Rooskie. Hope you have a great day.” He couldn’t believe his eyes. Rooskie was his nickname for his daughter, Sumner. Tab had written that note years earlier and placed it in his daughter’s lunch, and had reused the paper while labeling the parts for the 1966 Mustang before he sold it. Three years later, powered by a 302-cubic-inch V-8 with automatic transmission with front disc brakes, the 1966 convertible has been beautifully restored. Tab did the work himself and has no intention of letting the car go again. “No, it’s kind of a member of the family now,” he says. Rooskie is now 31 years old. Was it meant to be? Lagow definitely thinks so. And the car’s customized license plate says it all: 66MNT2B.